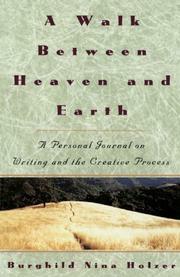  Informational rather than inspirational, a journal about journal-writing as a spiritual search, by a teacher of creative writing at Foothill College in Los Altos, Calif. From fall 1987 to summer 1988, Holzer kept two journals: one a record of her writing progress, the other a personal chronicle she hoped to keep separate from the first. In the book, however, they overlap; the personal journal creeps into the creative one, which becomes, for her, a mystical journey. She records dreams, her sense of aloneness, winter sorrows; she stops torturing herself about what exactly she is doing by reminding herself ``a journal can be anything!'' Reviewing the ``vision quest'' of her journal, she notes patterns and turns of character. She finds herself preparing for the inevitable end result of her father's lingering mortal illness and grieving for a dead brother, a doctor who was killed by a snow-grooming machine during the Olympic games in Calgary, Canada--a death prefigured by a dream she recorded in her journal. She visualizes his hands being whole, ``his good hands that had held so many.'' Later she refers to another painful memory: ``Perhaps my uterus wants to cry the story of the child I lost, of what wanted to be formed, and what slipped out into darkness before it could be held securely by the arms near the heart....And maybe I need to discover that this big boulder sitting in my throat consists of a huge mass of words, compacted into stone.'' Sometimes she takes her students for a walk in the woods or fields and, to expose them to nature writing, reads them haiku by Basho. Although this is more a public record of private thoughts than a how-to book, the use of Latinate words and catch phrases like ``creative process'' and ``learning process'' at times gives it an academic tone somewhat at odds with the personal nature of the material. Creativity ought to be more interesting than this.